In case you do not have a high temperature but still suffer from sore throat it won\\’ t do you any harm if you steam a bit your feet or just keep them into a hot water for several minutes since the doctors claim that a throat health has a straightforward relation with receptors which are present in human feet. In other words that means if you have everything settled with your feet in the right and healthy way it will positively influence your throat so that it would be OK. In some European countries like Finland and Russia and others people prefer to do a more radical procedure which is to go to sauna where they have the whole body being warmed up to a certain degree by hot air containing special essential oil. Being in sauna or “banya” (in Russia) you\\’ d better pick up a besom with you to get rid of pain as well as inflammation feelings. There you\\’ d better do some breathing exercises since it will facilitate the overall breathing process of yours. It occurs rather frequently when a man has a cold or an attack of influenza. As it was mentioned before we have up to 20 per cent of people with sore throat caused due to strep throat infection. We also said, that strep throat is an infection of the pharynx, caused by streptococcus bacteria, whereas sore throat may be a viral or a bacterial infection. In this case one can treat him or herself without the help of a doctor BUT if you have the general knowledge of this illness. For example, in some third world countries people sometimes have no money for the doctor’s visit and they try to use some local (folk) that help in the majority of cases. 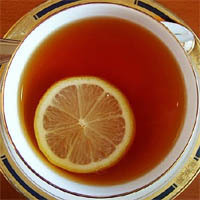 Effective way to cure sore throat might be to mix 4 cloves of garlic, 1 tea spoon of honey and 1/4 teaspoon of cayenne. Have all of this stuff been mixed up and consume everyday during the period you have a sore throat. Obviously, you have to chew this mixture well, before swallowing. In a normal cup of water place some Holy Basil leaves to be boiled up afterwards. Then, allow it to cool down and strain well. That you are supposed either to drink or use it for gargling. The usage of simple home remedy for a sore throat treatment would be to gargle salty water, i.e. lukewarm water. This normally brings surely provide relief. Add to a pint (or 400 gramms) of boiling water 1 or 2 tea spoons dried chamomile blossoms. Then, let them steep well and then strain the water. You ought to have a cup of this decoction, every few hours while sore throat is disturbing you. Another effective home remedy for sore throat is just to mix a tea spoon one of apple cider vinegar and another one with honey, along with a pinch of cayenne pepper and extracted juice of 1/3rd lemon, in a cup of hot water. Stir the stuff well before drinking and have this mixture up to 4 times in a day. Boil a glass of water adding in a pinch of powdered cloves so that a pinch of pepper powder and 1 tea spoon honey. Then drink this cocktail once in a day in early morning. This is an effective way to cure sore throat in countries like China and India. In a big glass of boiling water just add 2 sprigs of coarsely chopped parsley and 3 whole spice cloves. Then mix it a bit and add 1 tea spoon of powdered myrrh with 1/4 tea spoon of powdered goldenseal. After some additional mixture them up let the water simmer for sometime and cool it and then strain the decoction. This substance is commonly used for gargling. Take a cup with a lid and pour some honey into it. Now then, cut down an onion into small pieces and soak it in the honey. Then put on the lid and keep aside for an hour. Afterwards, have a tea spoon of this honey every few hours being consumed. Take a fresh lemon and cut it into two halves. In one part sprinkle some salt and black pepper. Press it with a knife so that the pepper and salt penetrates in and warm this lime piece so that to be licked later on. You may have this twice or thrice a day so that too get immediate relief from sore throat. In 500 ml of water you add around 30 grams of fresh sage water and 1/4-th teaspoon of cayenne. Let it be boiled and allow it to cool. Later on strain this decoction and drink once or twice in a day.